So the sinker would be on here, then they’d be jigging like so with the bait on the hook…One of the lines will catch a halibut first and still another halibut will go on the other hook, so this person would bring in two halibuts at one time. This must be the start of commercial fishing! 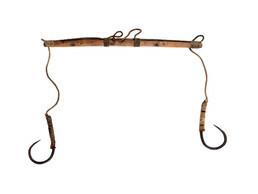 This halibut fishing rig has two iron hooks attached to a wooden bar, and was used with a stone or lead weight that held it on the ocean bottom. Two halibut might be caught at once, or more likely the advantage would lie in having two pieces of bait in case one was stolen. This style of hook was adopted after contact with Norwegian fishermen who came to the islands in the late 19th century. Aron Crowell: Vlass, what do you think about these hooks? Vlass Shabolin: It looks like these hooks are factory made. Probably from San Francisco or Seattle or whatever and [they gave it to the Aleut] fishermen. It’s a double-hook and the way it is, it was connected to the main fishing line at the center. Daria Dirks: I don’t think it was given, I think they made it. Mary Bourdukofsky: They used to buy the fishhooks from the store. Vlass Shabolin: No this is something way after the Aleuts did it their way with wooden hooks and bone, then they went to steel. Aron Crowell: Have you ever seen or heard of Aleut fishing rigs that were like this? Vlass Shabolin: This is the first time I’ve seen [something like this]. These hooks had to be factory-made in Seattle or San Francisco, or they could have gotten a spike and grinded it . . . This is something we call a circle hook. Maria Turnpaugh: I remember my father used to make hooks. But I don’t know how. Maria Turnpaugh: Yes. I just didn’t pay attention at the time, but I know he used to make his own hooks sometimes. Vlass Shabolin: Yeah, with a little file. Mary Bourdukofsky: This looks like cord. . . this is not sinew. Aron Crowell: So like a cotton cord? Maria Turnpaugh: It looks like cotton cord. Daria Dirks: That would have to be pretty strong to get two [halibut] on this one. Mary Bourdukofsky: I’m pretty sure when they catch one, they pull it up or else it’ll get out of the hook. Aron Crowell: So it’s not clear what the advantage would be to have two hooks? Mary Bourdukofsky: In case one gets lost, sometimes they lose their [bait] . . . so we’ll call this a double halibut hook? Vlass Shabolin: It has to be a halibut hook but this stick is so soft. I mean, with the halibut on there, I think it would break. But I guess it’s hard enough to bring in a halibut.